Jerusalem, March 5, 2018 — Many animals use venom to protect themselves from predators and to catch prey. Some, like jellyfish, have tentacles, while others, like bees and snakes use stingers and fangs to inject their prey with venomous toxins. For a long time scientists believed that an animal’s venom was consistent over time: once a venomous creature, always a venomous creature. However, through a close study of sea anemones, Dr. Yehu Moran of Hebrew University’s Alexander Silberman Institute of Life Science, found that animals change their venom several times over the course of a lifetime, adapting the potency and recipe of their venom to suit changing predators and aquatic environments. Today, in a study published in eLife Science Magazine, Moran and his team describe their spectacular findings. They studied the Nematostella, a relative of the jellyfish, from cradle to grave. Nematostella are sea anemones that belong to the Cnidaria family of jellyfish and corals. They begin their life as tiny larvae and grow into animals measuring several inches long. While in the larvae stage, the Nematostella fall prey to larger fish but once mature, they become predators themselves, catching shrimp and small fish with their venomous tentacles. Dr. Moran found that while in the larvae stage, sea anemones produce uniquely potent venom that causes predators to immediately spit them out if swallowed (see video, attached). Later on, when the sea anemones grow big and become predators themselves, their venom adapts to their new lifestyle by producing a different kind of toxin, one best suited to catch small fish and shrimp. Over the course of a lifetime, as the Nematostella’s diet changes and they move from one aquatic region to another, they adapt their venom to suit their new needs and environment. “Until now, venom research focused mainly on toxins produced by adult animals. However, by studying sea anemones from birth to death, we discovered that animals have a much wider toxin arsenal than previously thought. Their venom evolves to best meet threats from predators and to cope with changing aquatic environments”, explained Dr. Yehu Moran. To track these changes, Moran’s team labeled the sea anemone’s venom-producing cells and monitored them over time. The researchers also recorded significant interactions that Nematostella had over their lifetime—first as prey and later as predators. These findings are significant for several reasons. First, venom is often used in medicines and pharmacological compounds. 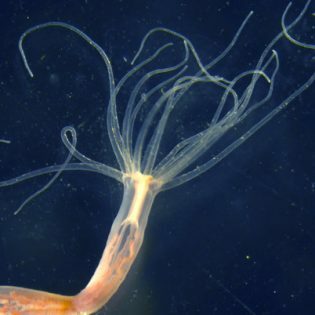 This study suggests that for animals with a complex life cycle there are many venom components that have remained unknown to researchers since, until now, researchers have only studied venom from adult sea anemones, missing out on the unique compounds that exist in larvae venom. These “new” compounds could lead to new medicines and drugs. Second, sea anemones, jellyfish and coral play a significant role in marine environments. A better understanding of their venomous output and effect on marine life ecology is crucial. Most fundamentally, Moran’s study sheds more light on the basic mechanisms of Darwinism: How do animals adapt to their changing world and ecological habitats? The Nematostella, with its changing venom, provides us yet another clue.